If some of the trendy gurus in work and office design are to be believed, teams and open spaces are the keys to spurring creativity and innovation. But hold on a minute, maybe this is going too far. While complete isolation and always closed doors are not advisable, the other end of the spectrum may not be such a great idea, either. What’s lost when we deny ourselves that time alone? From my own personal experience, I can tell you that stepping away from the routine and rowdiness of daily life allowed me to connect ideas I’d been wrestling with in new ways, follow creative impulses, and simply think about one thing at a time. Thinking about one thing at a time. How often are you actually doing that? According to MIT neuroscientist Earl Miller, our brains simply aren’t built to multitask well, which means we end up diluting the quality and efficiency of what we’re doing in the process. Time alone allows us to order our priorities according to what we need, rather than the needs of others. “The paradigm experience of solitude is a state characterized by disengagement from the immediate demands of other people—a state of reduced social inhibition and increased freedom to select one’s mental and physical activities,” write researchers Christopher Long and James Averill. In other words, when you’re able to disengage from the demands of other people, you’ve suddenly freed up the mental space to focus on longer-term, bigger-picture projects and needs. Porter also delves into the relevance of the extrovert-introvert paradigm in considering personal and work habits, citing Susan Cain, author of Quiet: The Power of Introverts in a World That Can’t Stop Talking (2012). As someone with both extrovert and introvert qualities — “ambivert” is the term now being invoked — this discussion resonates with me. I can be both fueled and drained by social gatherings. And while I enjoy the social aspects of teaching, facilitating, and good conversation, my thoughts and ideas tend to sharpen and clarify in a state of solitude. “In My Solitude” may not be a perfect fit for this post, but I’ll take any excuse to paste in a Billie Holiday rendition of a great old standard. Our workshop on workplace bullying in Boston last Friday and Saturday (reported on here) covered a lot of ground, and among the topics discussed was what combinations of personal qualities may serve to prompt bullying behaviors. Veteran public school educator Torii Bottomley observed that a prime pairing is a supervisor with low competence and low ethics and a subordinate with high competence and high ethics. This observation yielded many nods of approval. In essence, a subordinate presenting high levels of competence and ethics may pose a threat to a supervisor with the opposite qualities, especially if the latter is insecure and given to regarding talented subordinates as threats. Of course, authorities on bullying and mobbing behaviors such as Gary Namie and Ken Westhues have long recognized the intersection of competence and ethics as factors that may fuel abusive mistreatment of workers. But this hi-lo combo does neatly wrap it up in a bow, doesn’t it? Why is it so often that the best people are stuck in the middle and the people who are running things—the leaders—are the mediocrities? Because excellence isn’t usually what gets you up the greasy pole. What gets you up is a talent for maneuvering. Kissing up to the people above you, kicking down to the people below you. The obvious and very sad implication here is that if a highly competent and ethical employee wants to maximize her chances of survival at a less-than-wonderful workplace, she might well be advised to hide her talents and character under a bushel, or at least to ensure that they do not shine too brightly. Workplace bullying presents serious challenges to organizations, but it remains one of the most neglected problems in the realm of employment relations. Accordingly, this article addresses the implications of workplace bullying for organizational leaders and suggests measures that can be undertaken to respond to it. First it will describe common bullying behaviors and their effects on individuals and organizations. Next it will examine how organizations can act preventively and responsively to this destructive phenomenon. Finally, it will tie together these threads in the context of individual dignity and the practice of values-based leadership. Although much has occurred in the realm of workplace bullying and employee relations since the article was published, I think it holds up well as an examination of the implications of bullying at work for organizational leaders. The article has been very positively received, now ranking among the 1,000 most downloaded articles on the Social Science Research Network out of over 528,000 pieces posted to the site. You may freely access the full piece here. It starts at the top. Organizational leaders must send a message that workplace bullying is unacceptable behavior. Executives and managers who preach and practice dignity will see that quality resonate throughout an organization. Establishing a culture of open, honest, and mutually respectful communication will have the salutary effect of reducing bullying and other forms of employee mistreatment. Education and policies are only the beginning. The next step, a much more difficult one, is to enforce policies relating to bullying by conducting genuine follow-up investigations and where necessary, assessing reprisals, when complaints arise. Unfortunately, bullying targets often report that organizational responses to their complaints about bullying made their experiences worse. One of the most common laments is that “HR was useless” in handling complaints about bullying and in some cases turned out to be complicit with the aggressors, especially those higher up on the organizational chart. One of the most difficult decisions from both an ethical and business perspective is what to do with an abusive manager or executive. He may be seen as a “rainmaker” who is good at attracting business. He may be socially popular with others in management, including those who will determine his fate. Oftentimes, a workplace bully will have mastered “kiss up, kick down” tactics that hide his abusive side from superiors who review his performance. “Oh, I cannot believe he’d do anything like that to someone” is a common refrain from those who have been shielded from a bully’s conduct. If I could write a revised version today, I would say more about the importance of hiring and developing leaders with empathy and character. In the article, I talk about the value of social intelligence, but that’s not enough. We need more executives and managers with heart quality in addition to social smarts. For those interested in workplace values, ethics, and social responsibility generally, I also suggest browsing through the full archives of the Journal of Values-Based Leadership, which has grown into an excellent resource for scholars and business leaders alike. You’ll find a lot of great stuff there. I spent a good chunk of today and yesterday hosting a workshop on workplace bullying at Suffolk University Law School here in Boston. 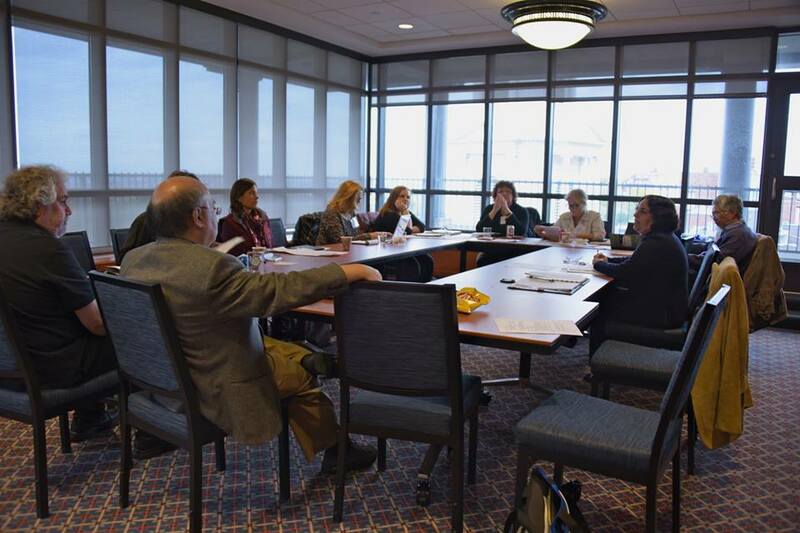 The goal of the workshop was to give feedback, advice, and suggestions to a group of individuals who are devoting time and energy to responding to workplace bullying through public education initiatives, publications, and law reform advocacy. Although I had high hopes for the gathering based on the list of participants, I wasn’t quite sure what the collective chemistry would produce. I am pleased to report that it was a very stimulating, intense, and moving experience, infused with genuine fellowship and even moments of humor. We covered a lot of ground during our conversations, and the interactions and exchange among our participants made for an honest and gently respectful learning environment. Ellen Pinkos Cobb discussed her global resource guide, Workplace Bullying, Violence, Harassment, Discrimination and Stress: International Laws, Developments, and Resources (2015 ed.). Ellen’s book is a superb compilation of relevant legal protections. Jay Fedigan discussed his planned documentary on workplace bullying, a multi-year project that will look at this phenomenon from multiple perspectives, including the legislative campaign for the Healthy Workplace Bill in Massachusetts. I have known Jay for many years, and I am delighted that he is devoting some of his talents to this new project. Carol Ann Geary discussed her workshops and programs on workplace bullying for librarians. Carol was prominently featured in a 2014 Boston Globe article on workplace bullying and the Healthy Workplace Bill. Steven Lawrence discussed how his work on servant leadership and organizations relates to workplace bullying. He also detailed why he recommends Suzette Haden Elgin’s book, The Gentle Art of Verbal Self-Defense at Work (1999), for dealing with bullying-type behaviors on the job. Tanya Sidawi-Ostojic discussed her research on Post Traumatic Embitterment Disorder and its relationship to workplace bullying. Tanya is building upon the work of Dr. Michael Linden, who first proposed the diagnosis of PTED for many of those who have experienced traumatic events. Jessica Stensrud discussed her emerging leadership role in bringing the anti-bullying Healthy Workplace Bill to Rhode Island. Jessica is a long-time activist who is helping to expand our legislative advocacy efforts. Serving as discussants were Eunice Aviles, Torii Bottomley, Deb Falzoi, Denise Bartholomew Gilligan, Henry Jung, and Greg Sorozan, all of whom brought plenty of experience and wisdom to our discussion. We also were joined by Katie Fedigan, who helped her father Jay with some of the filming. For several participants, being a part of this gathering called upon them to dig deep into wells of courage, for their own experiences of being bullying targets were part of our conversations. We specially thank them for their contributions to our understanding. 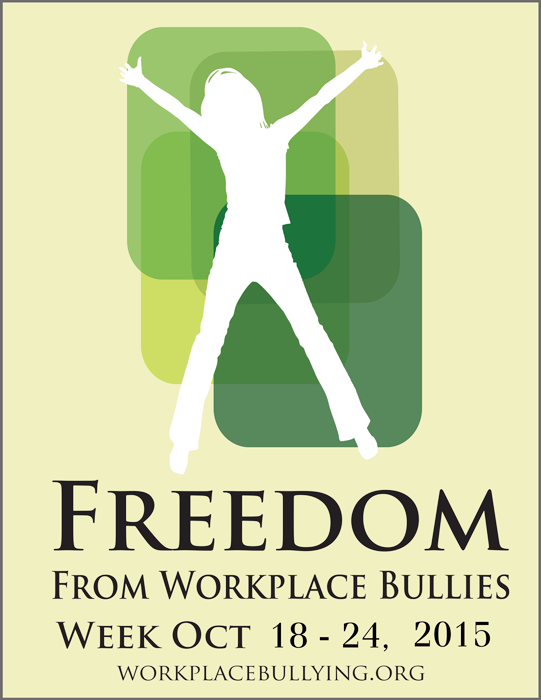 Observances such as Freedom from Workplace Bullies Week serve as an invitation for reflection and assessment. Recently, a written feature about my work concerning workplace bullying published on my University’s website referred to my “two-decade battle against bullying on the job.” The writers took a slight liberty there; my fateful initial contact with Drs. 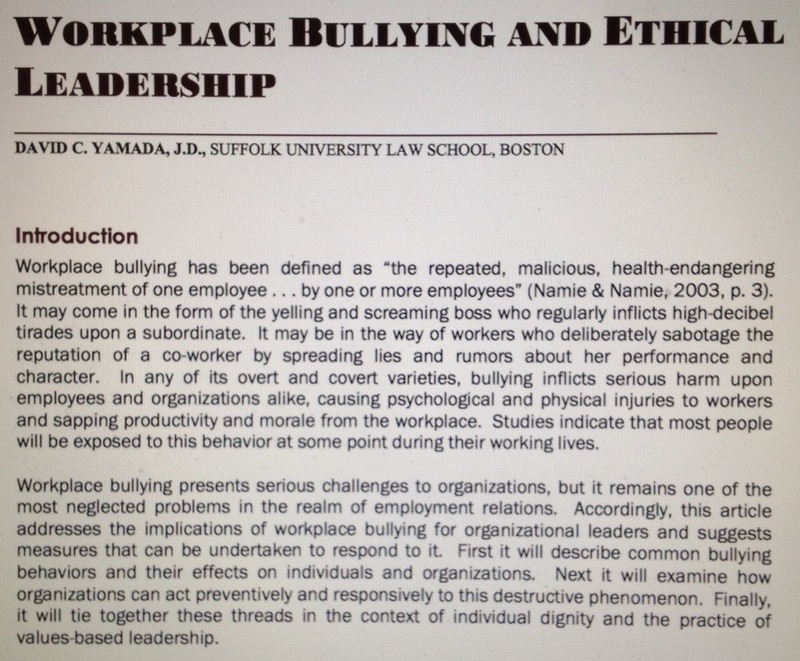 Gary and Ruth Namie of the Workplace Bullying Institute was made in 1998, so I’m not quite at the 20-year mark. But even 17 years is a long time, and during this stretch I’ve seen a term that once barely appeared on the radar screen of American employee relations now entering its mainstream. Indeed, we are moving past the point of having to spend 10-15 minutes simply explaining what workplace bullying is and how much harm it can inflict. Instead, we can devote greater attention to preventing, stopping, and responding to abusive behaviors at work, while connecting bullying to other forms of worker mistreatment. Along those lines, some readers may have noticed an editorial shift on this blog concerning workplace bullying-related commentary, whereby I’ve been devoting more time to discussing potential new understandings, responses, connections, outreach, and solutions. I imagine that evolution will continue. Similarly, here in Boston we’ll be observing Freedom Week with a workshop at which we’ll be giving feedback, advice, and suggestions to a group of individuals who are devoting time and energy to responding to workplace bullying through public education initiatives, publications, and law reform advocacy. It will be a wonderful opportunity to explore this topic in a small-group setting that promotes conversation, shared insights, and fellowship. I give a short personal history of my involvement in the workplace anti-bullying movement, and some of the accompanying lessons I’ve learned about legal and social activism, in my forthcoming law review article, “Intellectual Activism and the Practice of Public Interest Law” (Southern California Review of Law and Social Justice), a draft of which may be downloaded without charge. I hope that readers who want to learn more will find it interesting. Freedom from Workplace Bullies Week is an annual observation started by the Workplace Bullying Institute to grasp the impact of workplace bullying and what we can do about it. For me, it’s a simple, gentle reminder: The work goes on. This work should be grounded in an understanding that preventing and responding to bullying at work is a multi-faceted endeavor. Social workers are taught early in their training about systems theory, which explains how human behaviors are interconnected in complex ways. A problem that, from a distance, may appear to be an isolated, individual situation typically links to other persons and organizations, at least once you take a closer look. This applies to both causes and solutions. Workplace bullying, mobbing, and abuse rarely occur in a vacuum. It follows that preventing and responding to these behaviors requires buy-in from all stakeholders remotely connected to employee relations. They include, among others: Workers, their families, and their friends; labor and civil rights activists; executives, managers, and human resources directors; lawyers and legislators; mental health and medical professionals; and educators and researchers. Furthermore, workplace bullying is related to many other forms of interpersonal abuse, including school bullying, cyberbullying and stalking, public mobbing, domestic and family abuse, and elder abuse. While each form of mistreatment presents its own unique dynamics, you’ll find plenty of similarities as well, including patterns of individual behavior, harms to targets, and institutional responses (or lack thereof). In some instances, the aggressors may cross into different settings. A person who experiences one form of abuse may be more vulnerable to another in the future. Regardless of the specific context, others besides the aggressor(s) and target(s) will be affected. Generally, an overall social ethic can seep into sub-settings for good and bad alike; societal cultures vary widely in their rejection or acceptance of abusive behaviors. This also is why I’ve been sounding a broader theme of human dignity in a lot of recent posts. The sooner we can build our broad-based, interconnected network of individuals and institutions committed to human dignity, the faster we’ll see a reduction of workplace bullying and other types of mistreatment.